In this video we will discuss a scenario when a deadlock can occur in SQL Server. In a database, a deadlock occurs when two or more processes have a resource locked, and each process requests a lock on the resource that another process has already locked. Neither of the transactions here can move forward, as each one is waiting for the other to release the lock. The following diagram explains this. 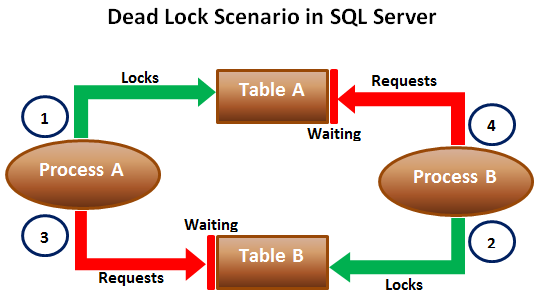 When deadlocks occur, SQL Server will choose one of processes as the deadlock victim and rollback that process, so the other process can move forward. The transaction that is chosen as the deadlock victim will produce the following error. Let us look at this in action. We will use the following 2 tables for this example. The following 2 transactions will result in a dead lock. Open 2 instances of SQL Server Management studio. From the first window execute Transaction 1 code and from the second window execute Transaction 2 code.